Following a wave of strikes in secondary schools in Bushenyi region, at least of 44 secondary schools in Sheema district have been closed. Of the 44 schools, only two schools had not experienced a strike. Out of the closed schools, 29 are private, while 15 are Government-aided schools. 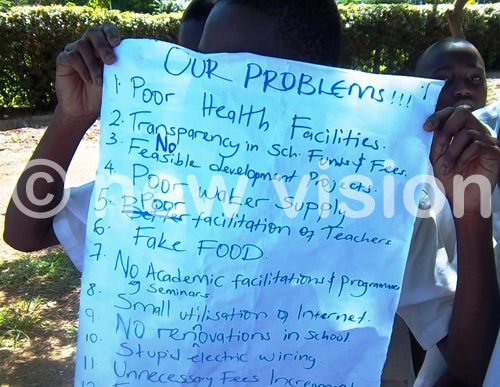 The district education officer, Esau Nshabeirwe, said the decision was reached on Friday during a meeting with different stakeholders at Kyalimanya Hotel in Kabwohe town. All the head teachers were ordered to send students home for the time being. They will report back one week before the official opening of 3rd term. For 4th and 6th grade students, their district mock examinations have been postponed. Nshabeirwe told reporters that some students in schools like Sacred Heart SS, Mushanga had caused extensive damage to school property after three arson incidents. Nshabeirwe said security operatives are carrying out investigations, saying the fires and strikes have become rampant. The issues the students are forwarding include social hours, corporal punishments, reinstating and half-term periods for students. “We are in discussion to put in place mechanisms of accommodating some of the students’ demands,” he said. Nshabeirwe appealed to parents to talk to their children on the issue of discipline, saying it’s very unfortunate they have made schools suffer huge losses.